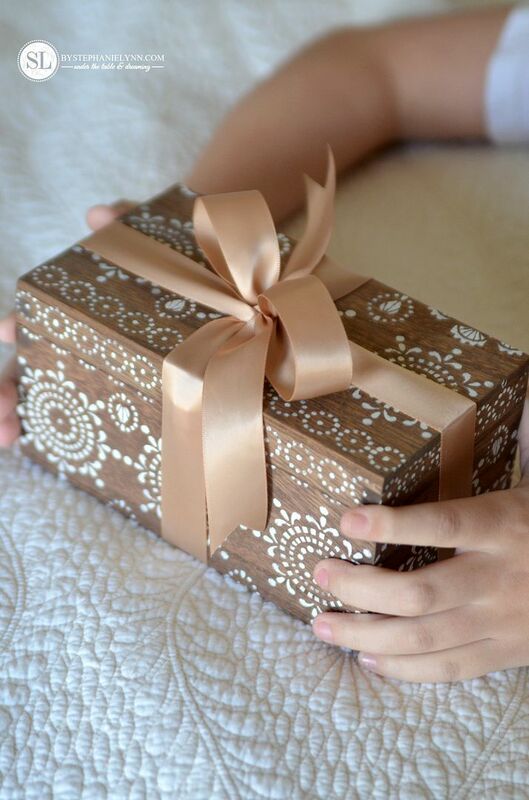 Coming up with unique gift ideas for that special someone that ‘has it all’ can be difficult. Especially when that special someone has been your only Valentine for almost 20 years! Despite the time it may take to pin down that perfectly fitting gift, I still somehow enjoy the thrill. Typically, giving gift cards are at the bottom of my list, as a last resort; however, the gift I’m sharing today is packed full of them and keeps on giving long after the holiday has come and gone. 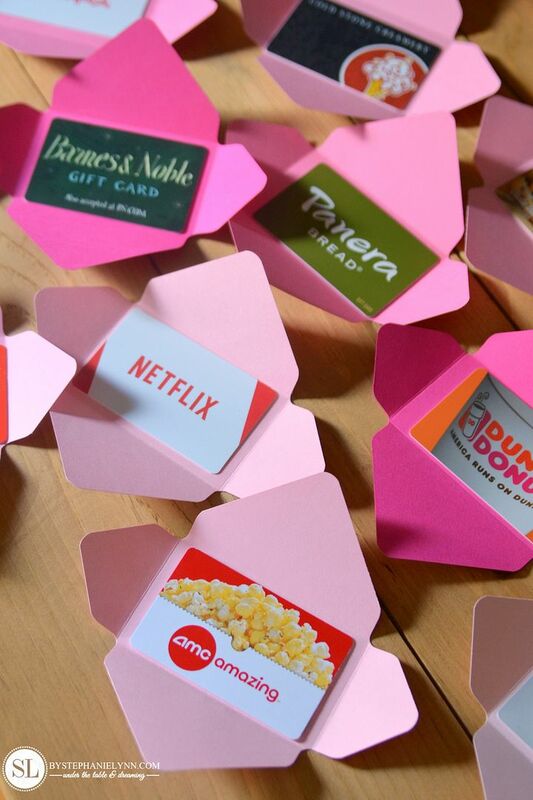 This Date Night Gift Card Box is a gift that actually spreads your love throughout the entire year with twelve pre-planned, and paid for, mini dates. The dates can be as extravagant as you would like them to be or just plain, simple and fun things to do. The gift cards and ‘adventures’ are fully customizable to the things you enjoy doing with your favorite someone. 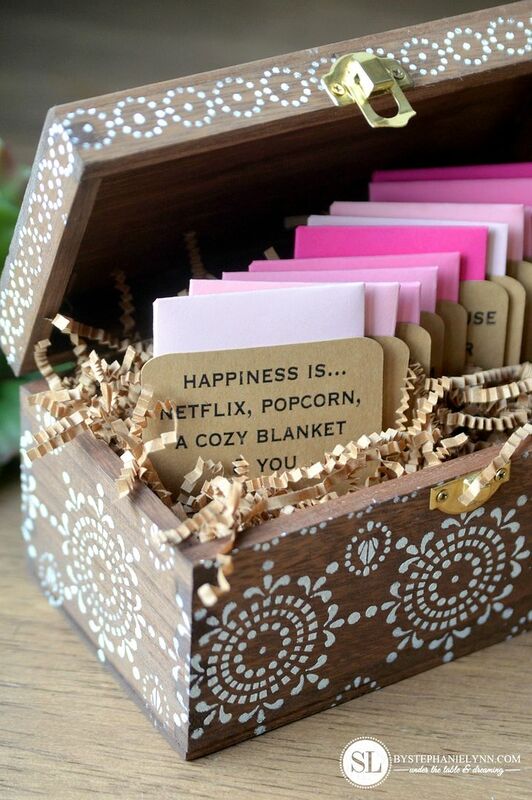 And this Date Night Gift Card Box works for any holiday, any couple, any age. I originally used this idea as a Christmas present for my in-laws a couple of years ago. I loved the idea that they could reach in the box throughout the year and grab a pre-planned, pre-paid, ‘mini date’ whenever they were looking for something fun to do. So this year I thought I would re-invent the idea for my valentine (and me) to enjoy as part of the Michaels Makers DIY Valentine Challenge. even including the gift cards. This Date Night Gift Card Box can be as elaborate or simple as you want it to be and does not take much time to put together. 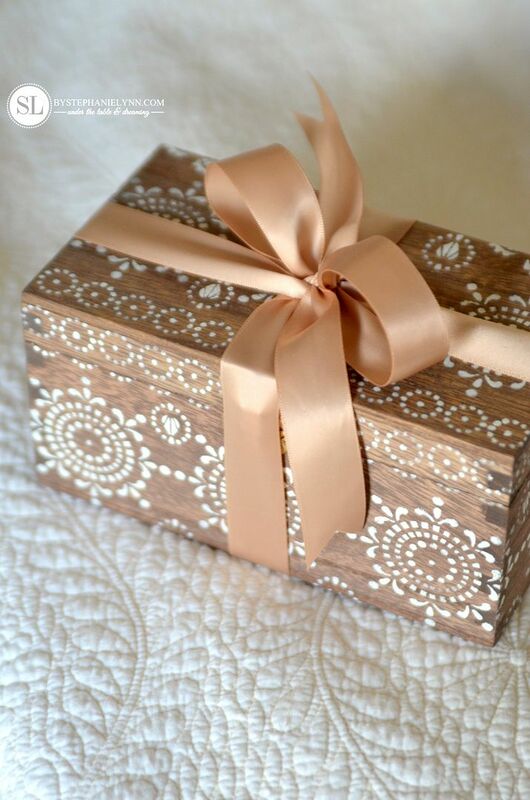 A perfect way to personalize a special gift for your love one. There are even some printables included below if you are looking for some mini date ideas to get you started! Step One: Stain or paint the unfinished wooden box. There are a wide variety of wooden boxes in the unfinished wood section that are perfect for this project. I opted to stain this particular box with Minwax Stain. The stain was applied with a foam applicator, then the excess was wiped with a clean cotton rag. 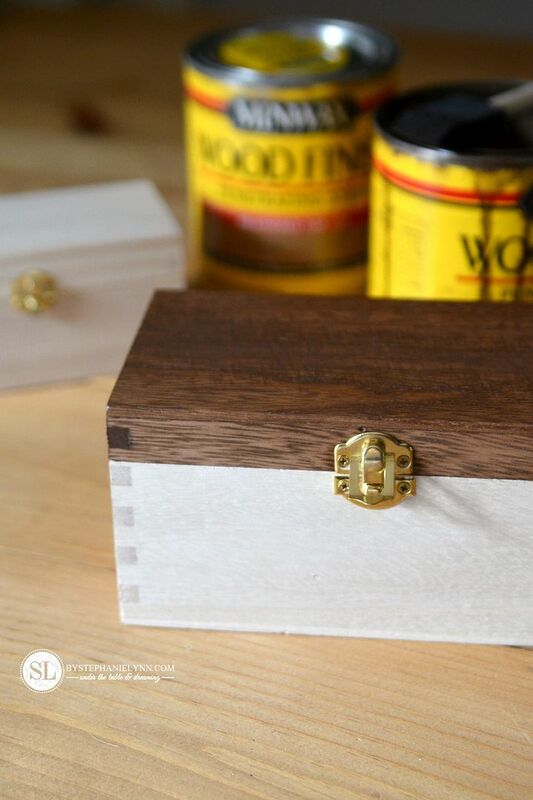 The stain soaks into the wood and dries almost instantaneously making this a quick and easy step. For a finished look, stain was applied to the inside of the box as well. 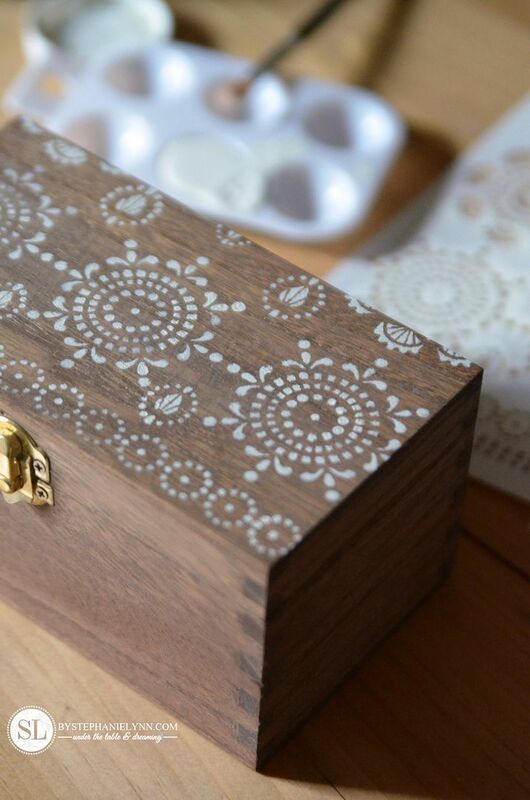 Step Two: Stencil the decorative pattern onto the box. 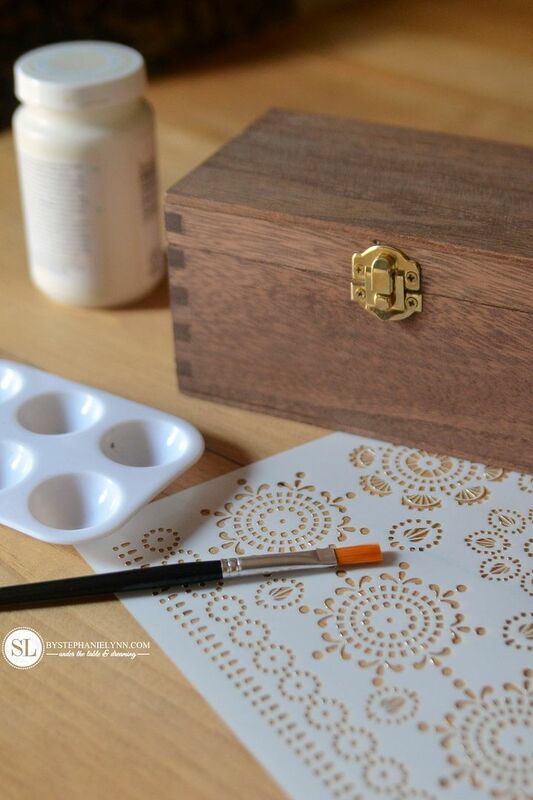 Once the stain was completely dry, I used this Accent Stencil to apply a decorative pattern to the box. The stencil set comes with two separate laser cut stencils. Sections of smaller stencil were used for this project. 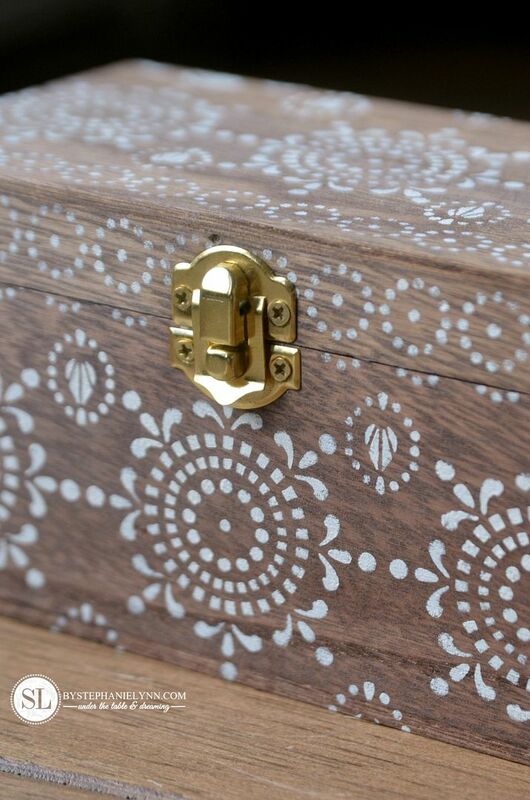 Working with one section of the box at a time, the stencil was simply held into place and dabbed with a light layer of Chalk Paint. The hardware was simply removed with a small screwdriver prior to stenciling the front of the box – then attached once the paint was dry. And again, the light layers of chalk paint dry real quickly. 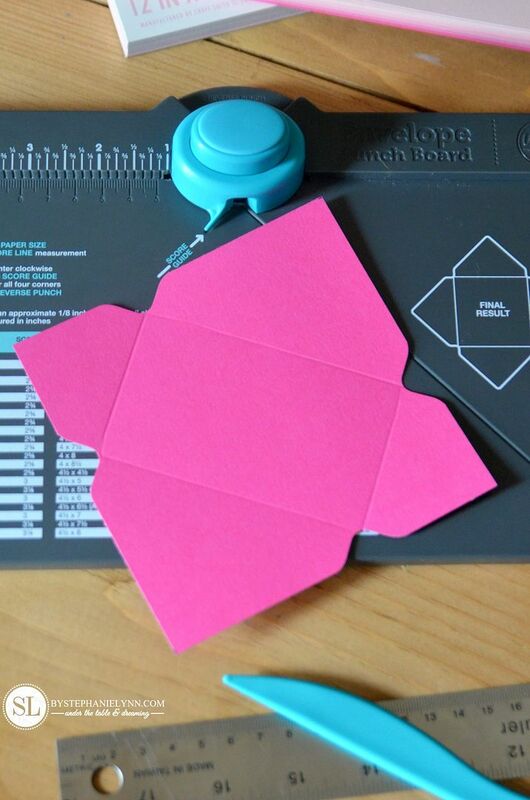 There are a couple of different options when it comes to making envelopes for the gift cards. For this project I used an Envelope Punch Board. 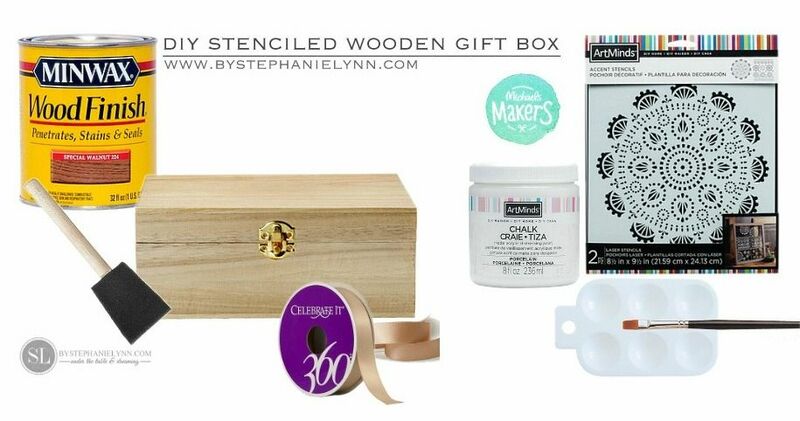 This punch board is a great addition to add to your craft closet for giving gift cards alone, although it can be used for making over 60 different sized envelopes. 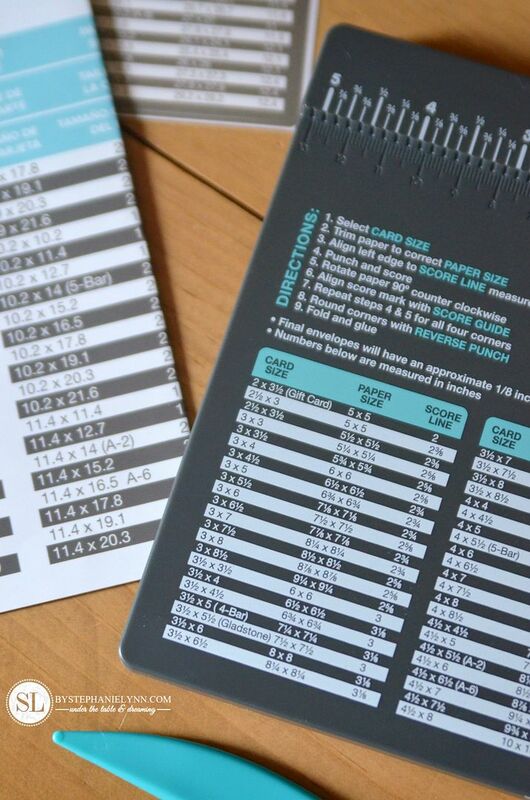 A measurement guide is printed right on the front of the tool – which tells you what size of paper you need to begin with for the envelope size you want to create – along with where the paper will need to be scored. 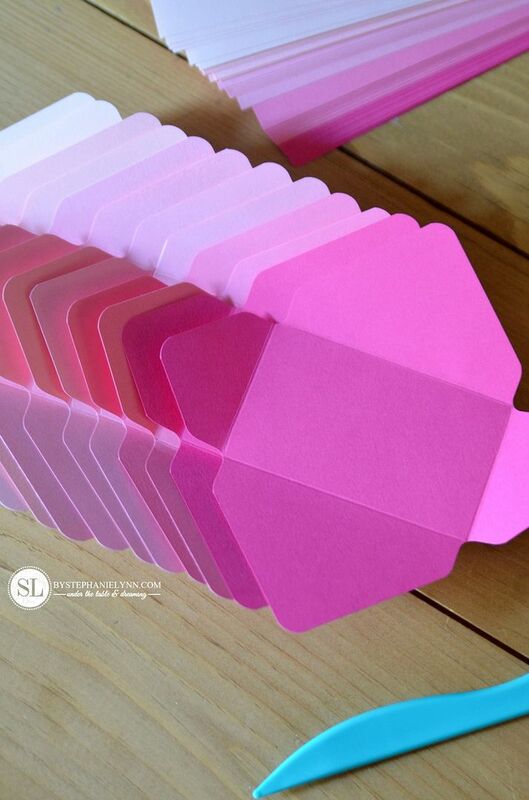 For the gift card envelopes, you’ll need to begin with a 5 inch X 5 inch square of card stock. 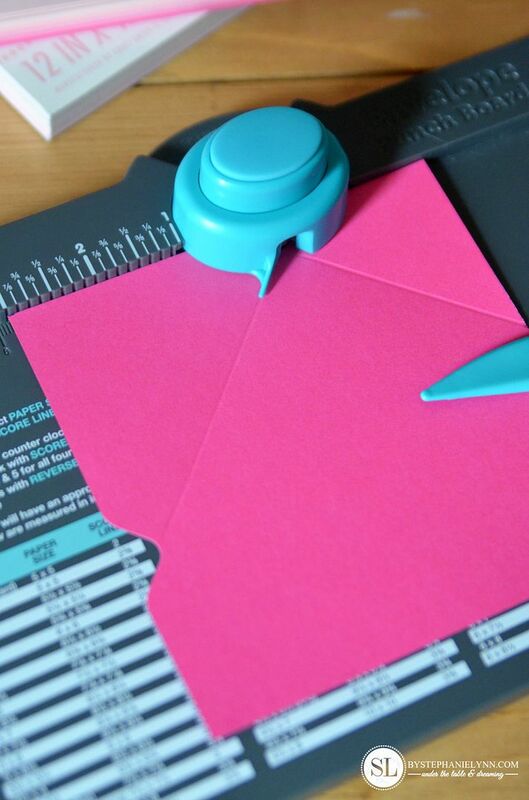 To create the envelope, align the left edge of the paper with the scoring ruler at the top of the tool. For the gift card envelopes, that would be the 2 inch mark. Punch the paper using the center punch then gently score with the included scoring tool, following the notch at the top of the tool. Rotate the paper 90 degrees, counter clockwise, and align the score line that was just created with the score guide located at the top of the tool. 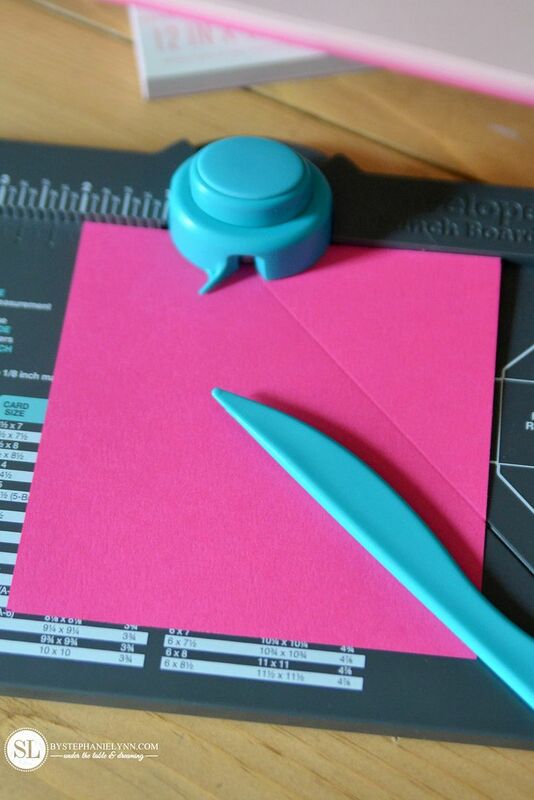 Punch the paper again using the center punch, then gently score, following the notch at the top of the tool. Repeat these steps two more times, until all four corners of the paper is punched and scored. The last step is to round the corners of the envelope using the reverse punch, which is located on the back of the tool. The whole process takes just a couple of minutes from start to finish. 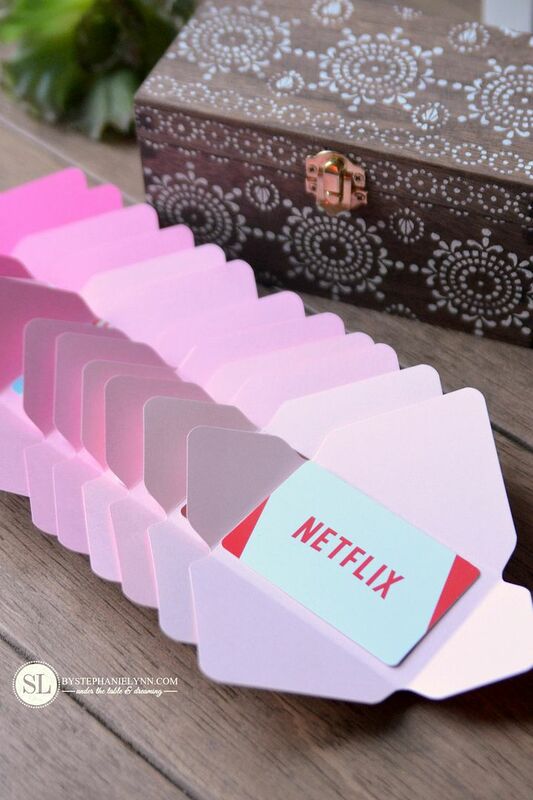 A variety of colors were used from the Pink Buttons Cardstock Pack to punch a total of 12 envelopes for the Date Night Gift Card Box. 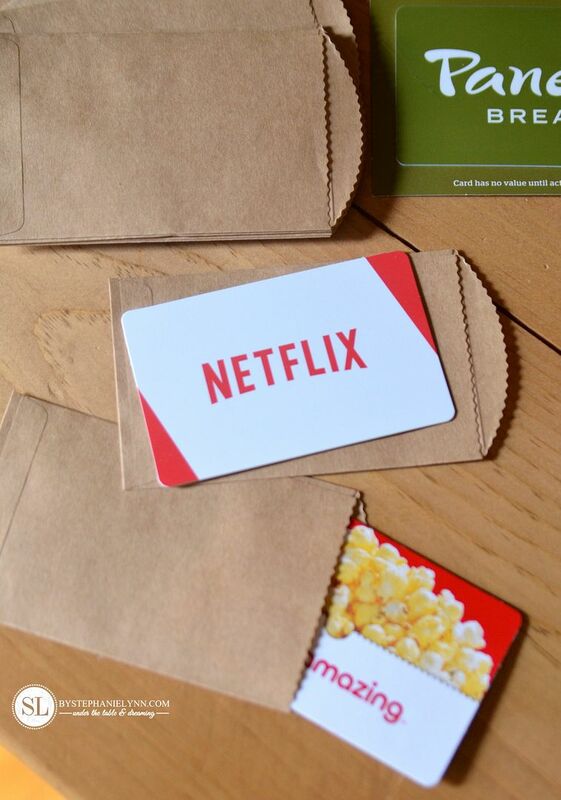 If you are pressed for time, or do not want to invest in the envelope punch, Mini Paper Sacks can be used to hold the gift cards. The gift cards for our Date Night Gift Card Box were conveniently picked up right at our local Michaels Store, from the Gift Card Mall display near the registers. 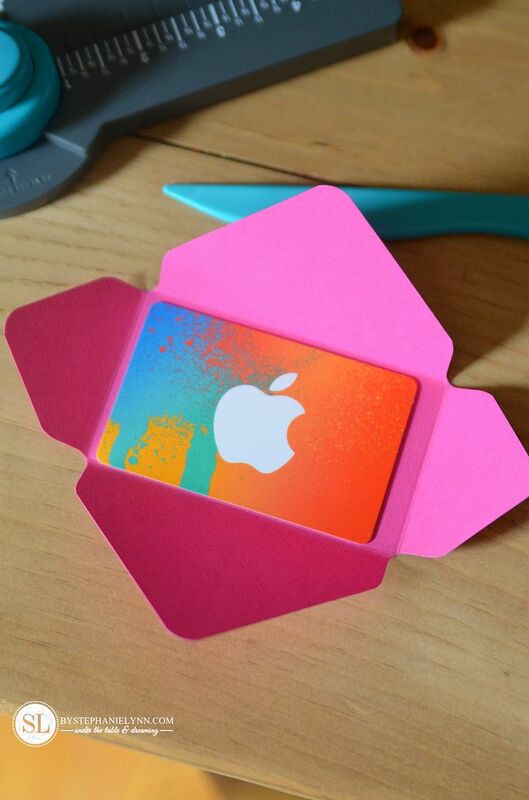 The gift cards can customized to fit your individual interests – as extravagant or simple as they may be. For our Date Night Gift Card Box I chose 12 ‘mini dates’ that we can use throughout the year, when we are looking for a special little treat or just something fun to do. I created a series of cards to label each gift card. 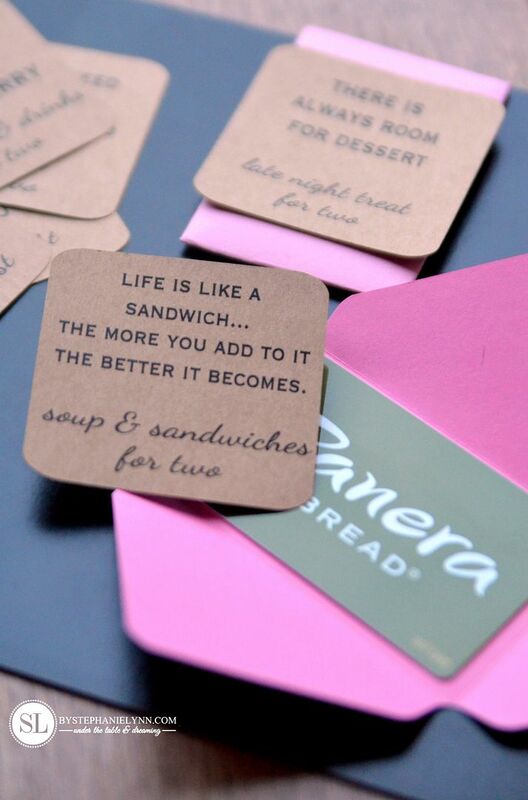 The cards were simply printed on Kraft Cardstock, cut out, and glued to the front of each gift card envelope. The cards can be downloaded and printed out using the links below or create your own using the blank templates. Wishing you a wonderful Valentine’s Day this year! Who will you be showering with love? This post is brought to you by Michaels . The opinions read here are entirely my own. We all appreciate flowers and chocolates, but nothing beats a handmade gift from the heart. Whether you’re crafting a personalized card or helping your tiny cupid make school valentines, Michaels has everything you need to celebrate the day of love. Looking for more organization inspiration? 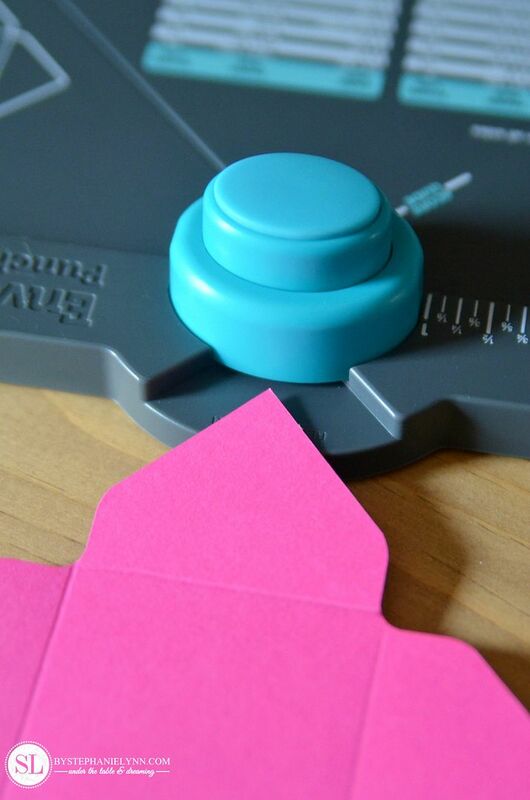 Make sure you visit Michaels’ blog, The Glue String, to see the rest of the Michaels Makers’ DIY Valentines ideas. XOXO ~ Happy Crafting! Excellent ideas!!! Totally plan to copy some of these. 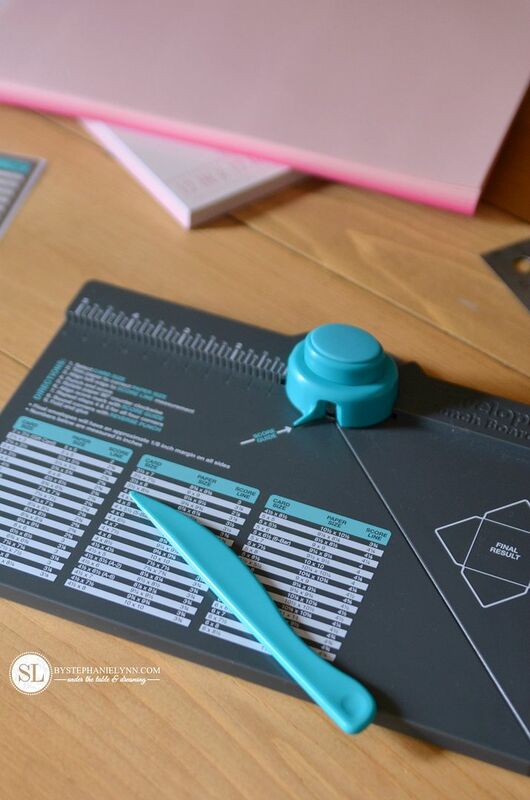 And this Envelope Punch board looks amazing. What a fun post! Thank you. Happy Valentines Day. Very beautiful and unusual. Thanks for the idea!